If you are a smoker you are doubtless aware that this is a very unhealthy habit, particularly for those suffering from chronic illness and breathing problems. But smoking is very addictive and even when people really want to stop smoking, it can be very difficult. However, there are lots of resources available that can help you stop smoking. Smoke Free Lothian have a base here in Bonnyrigg Health Centre and you can telephone them on 0131 537 9914. They can provide counselling on a one to one basis and also run a variety of drop in support groups that you can attend when you wish. 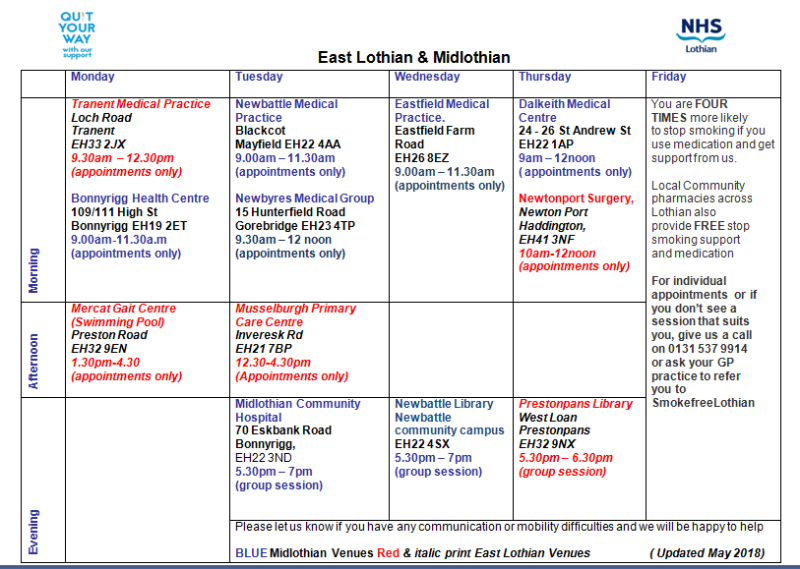 Your GP can also refer you to Smoke Free Lothian. Please see their timetable below, or download it here. There are also very useful resources to help you stop smoking available on the NHS Inform website.